Vertebrate blood vessels form stereotyped, hierarchical branched networks. Specialized endothelial cells (EC) called tip cells located at the extremities of growing capillary sprouts mediate their directional outgrowth. Research in Anne Eichmann’s laboratory is aimed at understanding the function of tip cell-specific signaling molecules, with the goal to manipulate guided vascular patterning. Another focus in the laboratory is to understand functions of vascular endothelial growth factors in the nervous system. 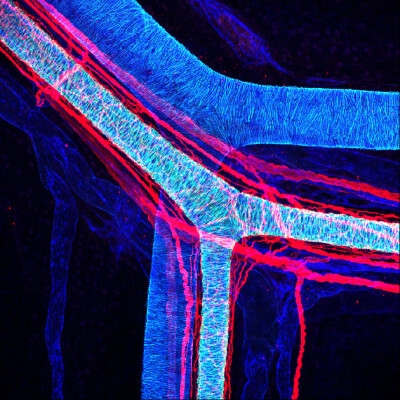 Specialized endothelial cells (EC), called tip cells, located at the extremities of growing capillary sprouts mediate guided vascular patterning. Tip cells exhibit characteristic features, including extension of filopodia that explore the tip cell environment, lack of a lumen and a slow proliferation rate. Following behind tip cells, other EC termed stalk cells form the capillary lumen and proliferate. Tip cell selection is induced by VEGF signaling through VEGFR2. 1/ Anne Eichmann’s laboratory and others have shown that tip cells also express high levels of the endothelial-specific Notch ligand Delta-like 4 (Dll4). Inactivation of one allele of the Dll4 gene in mice and pharmacological inhibition of Notch signaling using gamma-secretase inhibitors causes excessive tip cell formation. Dll4 inactivation leads to alterations in VEGF receptor levels, suggesting that Dll4 negatively regulates the sensitivity of ECs to VEGF and so acts as a ‘brake’ on VEGF signaling during capillary sprouting to ensure that only a limited number of cells form tips. 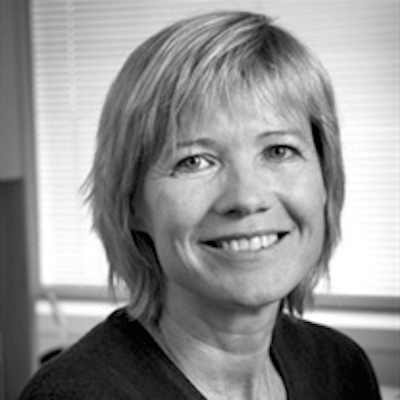 2/ Isolation of EC from dll4+/- mice has allowed Anne Eichmann and her team to identify novel tip-cell enriched genes, the function of which they are currently investigating. 3/ Capillary sprouting also shows morphological similarities to axon guidance. Like endothelial tip cells, axonal growth cones extend filopodia that sense and respond to extracellular guidance cues. By screening for the expression of axon guidance molecules in EC, Anne Eichmann and her team have identified several key molecules regulating capillary guidance. The Netrin receptor UNC5B is expressed in arterial EC and in tip cells. Loss of function of Unc5b in mouse and zebrafish embryos leads to ectopic filopodial extension from endothelial tip cells and excessive blood vessel branching. Treatment of endothelial tip cells with the UNC5B ligand Netrin-1 leads to filopodial retraction, an effect that is lost in Unc5b mutants. UNC5B thus functions as a repulsive guidance receptor controlling morphogenesis of the vascular system. Anne Eichmann and her team are currently studying a novel UNC5B ligand that they have identified. 4/ Anne Eichmann’s laboratory has also shown the selective expression of the VEGF co-receptors Neuropilin (Nrp) in EC of arteries (Nrp1) and of veins/lymphatics (Nrp2). Homozygous Nrp2 mutant embryos exhibit selective defects in the formation of lymphatic vessels, while their veins and arteries form normally. Lymphatic vessels are aberrantly positioned and enlarge rather than form branches. Antibodies blocking VEGF-C binding to Nrp2 and Nrp2-Vegfr3 double heterozygous mice reproduce these defects, indicating that binding of VEGF to Nrp2 and signal transduction through VEGFR3 mediate lymphatic vessel sprouting. They have generated transgenic mice expressing GFP in their lymphatic vessels to analyze live lymphatic vessel development in normal and mutant animals by multiphoton imaging. Vascular endothelial growth factors including VEGF-C also regulate development of certain neuronal cell types. They are using targeted inactivation of Vegfr3 in neural cells to understand VEGF-C/VEGFR-3 signaling in the nervous system. Research in Anne Eichmann’s laboratory is providing fundamental knowledge on a crucial mechanism for our body : the formation of our blood vessels. Moreover, the capacity to direct blood vessel growth may have important therapeutic implications for the anti-angiogenic treatment of solid tumors. PI3 kinase inhibition improves vascular malformations in mouse models of hereditary haemorrhagic telangiectasia. Ezh2 orchestrates topographic migration and connectivity of mouse precerebellar neurons.